Have you ever been afraid of really loving someone? Have you been afraid of letting someone really love you? Most of us have known this fear. To love and be loved is what we want more than anything, so why would we be so afraid of having the deep, intimate experience of loving and being loved? Why do we feel the most fear and anger with those we love the most? Why is it that domestic violence is considered by the police to be the most dangerous situation they can walk into? These are important questions. Let's consider some possible answers. As adults, we "fall" in love. This experience of loving at some point reminds us of how we were hurt in past experiences of loving. Of course, we are afraid of being hurt, no matter how big, strong or healthy we may happen to be. So we try to protect ourselves. This is human nature. It follows that the more we love, the more potential we have to be hurt, afraid and angry. Fortunately the love can grow and mature in such a way that the pain and fear are minimized and we no longer need anger for protection from those we love. This happens as our skill, strength, knowledge and awareness expand, allowing the more vulnerable inner core of love to grow and expand into the world around us. 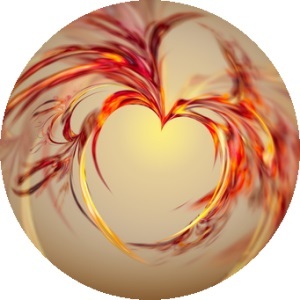 You can imagine this by picturing the walls of protection, fear and pain breaking down, allowing the inner circle of love to expand and blend with the outer circle of skill, strength, knowledge and awareness. So how does this happen in real life? The first step to true intimacy is to know, understand and become intimate with yourself. Your self is what you bring into a relationship. If you don't know this self or you feel ashamed of some part it, you will not be able or willing to share those aspects with your loved one. If there are wounds that have not healed, you will automatically hide and protect those wounded parts. You will not offer yourself fully to another, as is required for true intimacy, unless you feel good about the self you are offering. This simply means that each of us must make a journey into ourselves to learn about our own defense mechanisms, to manage our fear and to heal our pain. Only then can we reach the healing core of love that is the heart of who we are. Only then will we be willing to allow someone else to really know and love us for all that we are. The first part of ourselves we offer to others is what we consider to be our best self. We smile, shake hands or hug and act as if everything is just fine, whether it is or not. We show our social skills, demonstrate our knowledge and awareness in our conversation and try to give the impression of being a healthy, together person. This is the realm in which we operate at work or with people we don't know very well. This is the part of ourselves we use to "make a good impression" on someone we like. This may even be all we really know of ourselves. In school and throughout our lives, we have gained knowledge, skill, strength and awareness about the world around us--but we never really learned very much about ourselves. But it is your self that you are having trouble with. Your anger comes from you, not from somewhere else. WHAT ARE YOUR FAVORITE DEFENSES? One of the first things that happens when you start trying to get to know yourself is that you run into your own defense mechanisms. Defenses fall into two basic categories: fight and flight. In other words, we tend to protect and defend ourselves by either getting angry or getting out--of the situation. Do you know how to take a break in a relationship to give yourself time to think and calm down? If not, are you trying to solve your problems with anger, and finding that you're only making it worse? Do you shut down until you can't stand it any more and then you explode in anger? Don't judge yourself at this point, just try to figure out what your defense strategies are. Next ask yourself what you are afraid of when you are using these defense methods. Whether you know it or not, you are afraid of being hurt when you're angry. Fear drives your anger. If you don't know what your fear is, you will be blindly controlled by your anger. Fear falls into two basic categories. We are either afraid of being attacked, assaulted, smothered or violated (something happening to us), or we are afraid of losing someone or something we love (feelings of rejection, abandonment and jealousy come into play here). All of your fears came from some past experience of pain. To deal with your anger, you have to understand your fear. To understand your fear you have to understand and heal your pain. We have all been hurt. That's part of being human. If you don't know your pain, you are unconsciously driven by efforts to avoid it happening again. This is what drives most of the anger problems we see in the world every day. Your task is to learn how you were hurt, and heal those wounds. That will take the fire out from under your fear and anger, and you will be able to gain control. You can do it. Don't ever give up on yourself! When you have experienced some emotional healing from your past wounds, you will be a more compassionate, empathetic and loving person. This will make your efforts at intimacy much more successful. Intimacy is not just great romance, fun and affection. Intimacy is being close and connected through the hard times. Which means being comfortable with your own and your partner's pain and fear. I have found in my 30 plus years of counseling that when a person heals from her/his emotional wounds of the past, intimacy becomes possible for the first time. The skills are easy to learn, once you're ready!